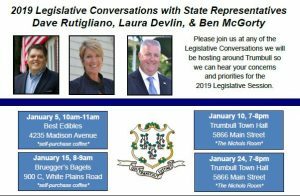 TRUMBULL- Trumbull State Reps. David Rutigliano (R-123), Laura Devlin (R-134) and Ben McGorty (R-122) will be hosting four separate ‘Legislative Listening Sessions’ over the coming weeks. The listening sessions are free and all Trumbull residents are encouraged to attend. Saturday, January 5, 10:00am-11:00am at Best Edibles on 4235 Madison Avenue. Thursday, January 10, 7:00pm-8:00pm at the Trumbull Town Hall on 5866 Main Street in the Nichols Room. Tuesday, January 15, 8:00am-9:00am Bruegger’s Bagels at 900 C, White Plains Road. Thursday, January 24, 7:00pm-8:00pm at the Trumbull Town Hall on 5866 Main Street in the Nichols Room. The three state representatives, who together represent the town of Trumbull in the CT House of Representatives, want to hear from their constituents, encourage them to join their legislators and talk about any issues, questions or concerns related to state government. The deadline for individual legislators to propose bills is January 18th; residents are encouraged to bring their ideas forward for possible consideration. The 2019 Legislative Session begins on January 9th. Reps. Rutigliano, Devlin and McGorty always have an open door policy and if you are unable to attend any of the four Legislative Listening Sessions listed above, you can reach them by calling 1-800-842-1423 or email their offices’ at Laura.Devlin@housegop.ct.gov, Dave.Rutigliano@housegop.ct.gov, Ben.McGorty@housegop.ct.gov. For updates on future coffees or legislative information please visit their legislative websites at www.repdevlin.com, www.reprutigliano.com, www.repmcgorty.com and sign-up for their newsletters.